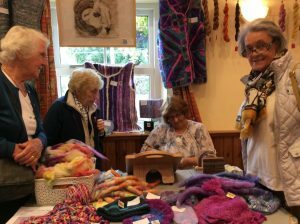 Northern Fells Group Spinning & Wool-crafts Open Day at Millhouse Village Hall on Bank Holiday Monday was a huge success with nearly 100 people attending a splendid and and attractive woven lengths were among the items on display and for sale. 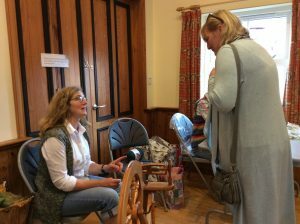 There were spinning demonstrations throughout the day and people were encouraged to have a go! Some hilarious results from the felting table were keeping everyone amused whilst others were very colourful event. 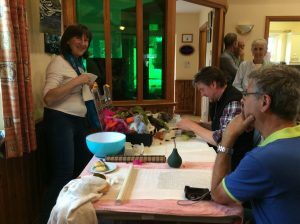 Carol Hine who runs the fortnightly sessions was herself amazed when everything was in place at how much the group has achieved in such a short space of time. 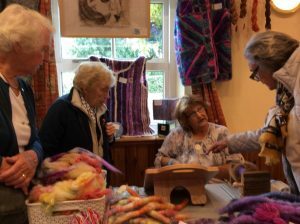 Beautiful felted items, lovely colourful rugs, gorgeous knitted garments, ingenious needle felted animals impressed with their achievements and most went home very happy with a finished piece. 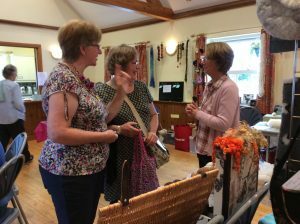 Much interest and lengthy discussions ensued over weaving on the loom and peg looms on display. There were great chances to learn to crochet and needle felt and many people were very keen to try, one of our first visitors in her eighties said she wanted to start a new hobby and left saying she was coming back to have a go at everything, it was all so interesting and fun. Several new people have expressed an interest in joining the group when it starts back on September 6th and fortnightly thereafter. Everyone involved worked hard but all said they had enjoyed the day and met so many interesting people; we even had visitors from abroad who were very complimentary about our Cumbrian hospitality. Light refreshments were available all day lovely homemade scones and cakes which were all donated and produced around £130 for the group for hall costs and further projects. In fact two new fleeces had been purchased before the end of the day and now the group has its eye on a further weaving loom.